Also known as Puerto Princesa Subterranean River National Park, Puerto Princesa Underground River is one of the New 7 Wonders of Nature around the world. There are small waterfalls, a dome that is 980 feet above the river, limestone formations, big bats, many river channels, sea creatures, and others; inside this famous cave – located about 50 miles on the northern part of Puerto Princesa City, in Palawan, Philippines. #1 - Go Discover Travel: Go Discover Travel gives a free pick up service from the hotel where you will stay at, on the day of your tour to the Underground River in Palawan. Your tour includes a round-trip, air conditioned van transfer; free buffet lunch; motorized boat ride; all entrance and permit fees; Department of Tourism Licensed English-speaking Tourist Guide; and a 45-minute Boat Tour of the Underground River. #2 - Deal Egre Travel Tour: Deal Egre Travel Tour can provide your round trip airport transfer, breakfast and 3 Days 2 Nights Air con lodging, plus an Underground River tour with lunch, good for two people. Their package does not include the airfare. #3 - I Link Underground River Tour: I Link Underground River Tour offer the following inclusions for your trip: permit to tour; pick up and drop off at your hotel, within Puerto Princesa City; entrance and boat fees; services of a Department of Tourism licensed tour guide; and picnic lunch. #4 - City Coliseum Underground River Booking Office: City Coliseum Underground River Booking Office provides the following for your tour: round trip van ride; Underground River tour and permits; boat ride; lunch; tour guides, etc. #5 - Asia Travel Underground River Special Packages and Tours: Your tour with Asia Travel Underground River Special Packages and Tours will include: Underground River Tour; air-conditioned transfers; boat rides; buffet lunch; licensed tour guide; underground permit and entrance fees; and shed rental. Make your trip to Palawan officially exciting now! 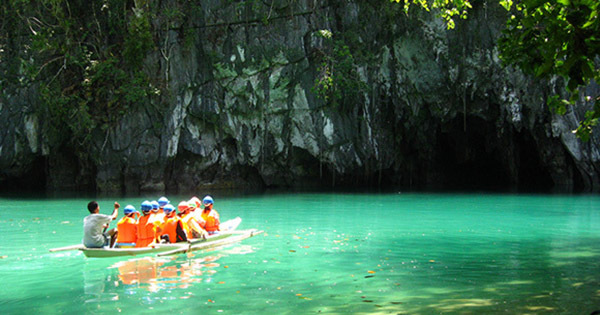 Book a tour to Palawan's Underground River, where you've got lots of natural stuff to discover!